In conflict/post-conflict settings, security sector personnel play a crucial role in the response to victims of violence. This may include: rescue operations, arrest and apprehension of perpetrators, conduct of interviews and investigations, conduct of forensic interview and medico-legal examination, enforcement of protection orders (where applicable), and recording/reporting in a confidential manner details of the crime. (Philippine National Police (PNP), National Commission on the Role of Filipino Women, and UNFPA, 2008.) Services provided in response to allegations of violence must be gender responsive from the outset to protect victims from further harm and facilitate redress for the crimes committed against them. This can prevent re-victimization of women and girls in the immediate response to an incident or during the investigation process. 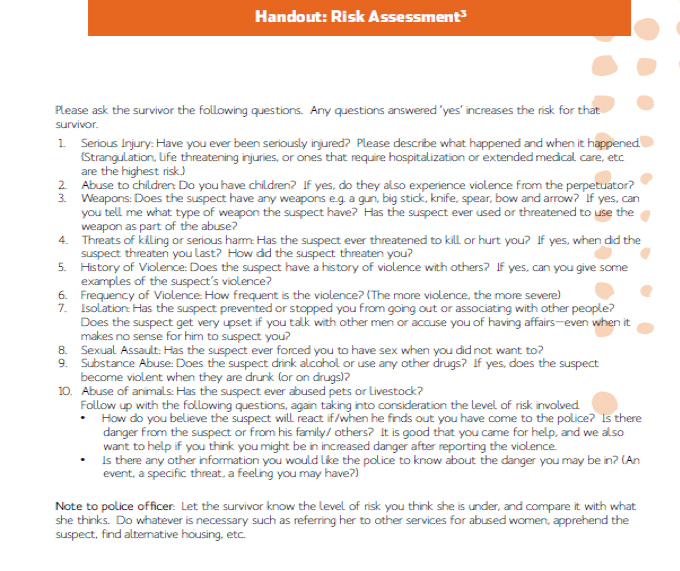 An appropriate response can ensure that victims receive the wider medical, legal and socio-economic assistance to which they are entitled and facilitate the prosecution of the perpetrators of violence (adapted from Security Module). Too few female members of the police force (excerpted from UNDP/NEPAL, 2010, p. 6). Develop detailed guidelines and protocols and procedures to guide officers receiving the initial call for assistance or arriving at the scene of the incident. Institutionalize and systematically apply technical standards and quality of service across all police stations or relevant security force units. Tailor the protocols and procedures to the specific context and foster ownership among those using or affected by them. Implement specific operational procedures and codes of conduct (related to deployment, patrolling patterns) to better protect women and girls. Research has shown that women with certain identities (e.g. migrants, those from ethnic minorities, etc.) may face additional discrimination, harassment and even violence from police when they seek help. Some states have sought to sensitize police officers by incorporated trainings on violence against individuals at greater risk. Ensure that techniques do not degrade or further traumatize the survivors and that minimize intrusion into their lives. Ensure that the investigation maintains standards for evidence collection that can contribute to future prosecution of cases, if the woman or girl chooses to pursue legal recourse. Promotes the dignity of the survivor. Ensures their physical and emotional safety. Does not blame or judge the survivor. Does not minimize their experience or question the truthfulness of their allegations (Sierra Leone Police/Ministry of Social Welfare, Gender and Children’s Affairs, 2008). Victim preferences: What does the victim/survivor feel comfortable to do? What sorts of services does the victim/survivor think will help her/him? Source: Alal, Y. 2009. “Responding to Violence Against Women: A Training Manual for Uganda Police Force,” pg. 46. Kampala: Centre for Domestic Violence Prevention (CEDOVIP). Source: Alal, Y. 2009. “Responding to Violence Against Women: A Training Manual for Uganda Police Force,” pg. 47. Kampala: Centre for Domestic Violence Prevention (CEDOVIP). Strengthen community trust, collaboration and engagement with security actors, raise awareness of and to promote zero tolerance for violence against women and girls through community-based policing and coordination with informal security providers and alternative mechanisms.